Wow. Has it really been a month since my last post? And is it really already August? Summer seems to finally have shown up around here, although the cool, misty mornings might lead you to believe otherwise. By late evening though, with the long summer sun still clinging to the sky, there is no doubt. People, there is nothing like the Northwest in the summer when it finally appears. You might have noticed, I said Northwest, and not Seattle. There are changes coming along my way, and one of them is a move. As much as Cam & I love Seattle, and our house and our friends, change happens. We are moving to Portland! Cam has started a new job at a fantastic new company, The Clymb, which does very cool flash sales of some of the best outdoor equipment available… if you ski, run, paddle or camp, check it out! Right now, they are having a great sale on Jacob Bromwell camping cookware… it’s not too late to get a great camping skillet and s’more skewers! Did I mention how much we love our friends? Earlier this summer, our good friend & neighbor Marci graduated from nursing school. 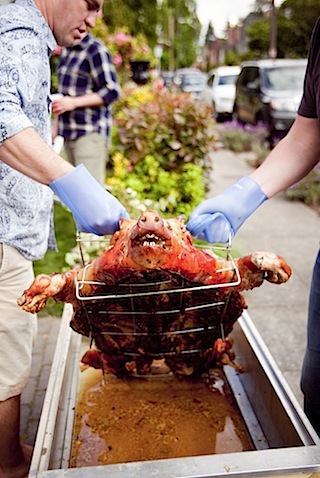 To celebrate we had a big block party complete with a pig roast. 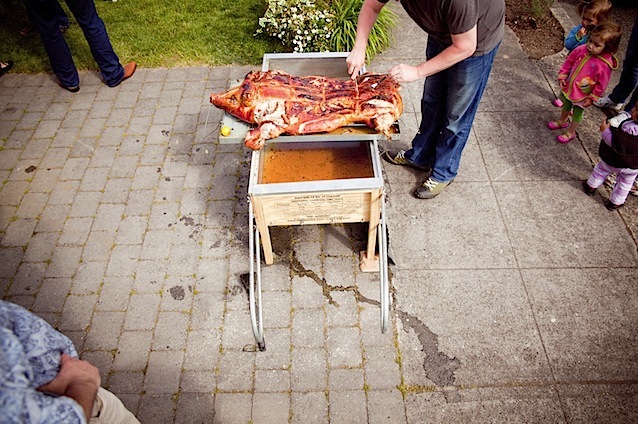 I should clarify, a whole pig roast. 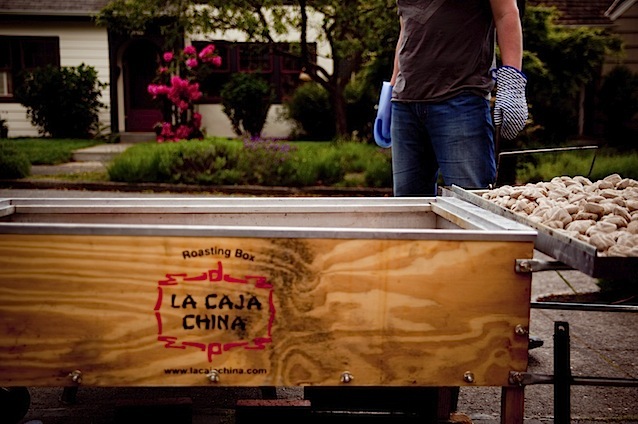 After procuring a whole pig from Rainshadow Meats, Cam borrowed a Caja China from another friend, and I spent an afternoon peeling garlic (10 heads!) 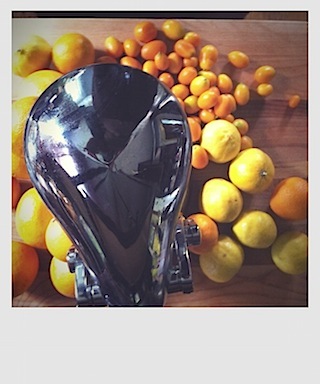 and squeezing citrus (ever try to juice a kumquat?) to create this mojo recipe. If you follow me on Twitter, you’ll have seen some of that chaos. 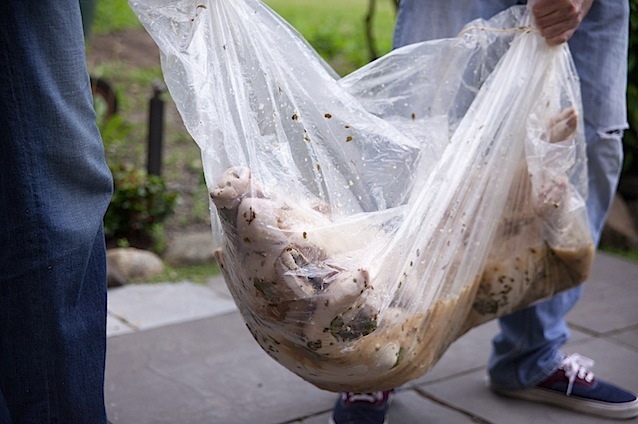 We marinated the pig in a large plastic bag in the bathtub. 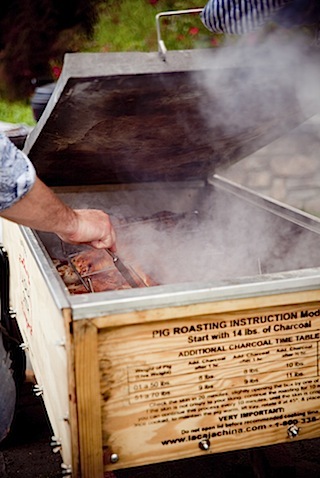 The pig is then slow roasted in the caja china box, with no-peaking for about 4 hours. 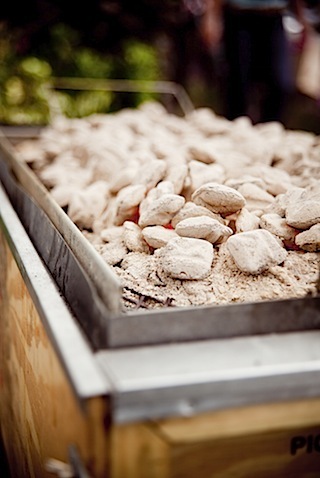 A quick flip and a stoking of the coals on top crisps up the skin perfectly. 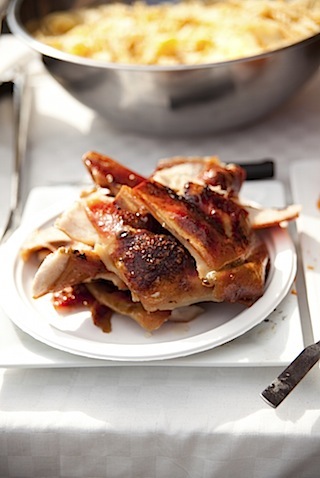 I have to admit, I was completely skeptical of the whole idea of the pig roast from the beginning, but I was converted. 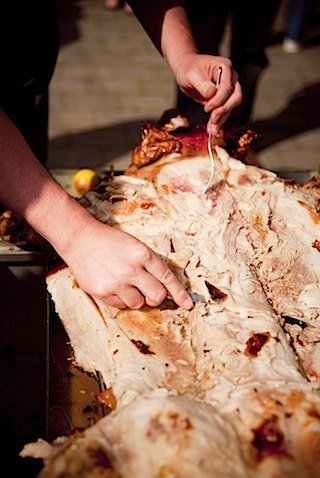 We ended up with about 30 pounds of the most amazing roast pork I’ve ever tasted. 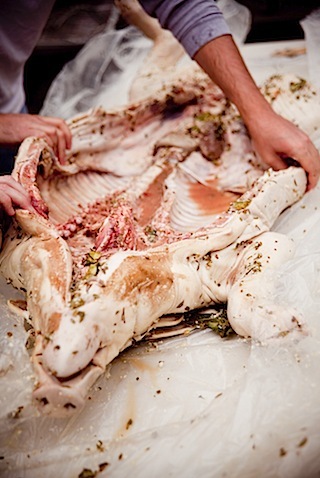 Here are some shots from the day… warning, the early shots are pretty graphic. It’s been a crazy summer, and I have much, much more news… but off to another photo shoot now! This entry was posted in Cook and Eat, Dinners, Food. Bookmark the permalink. 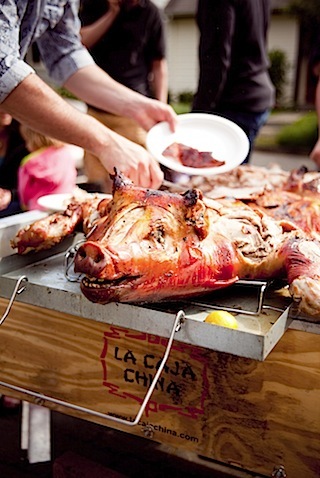 Summers are most definitely meant for feasts like this, I’d love to do a pig roast someday, Caja China or no. Good luck with your adventures in Portland, can’t wait to see the city through your lens! Great Post Lara! hope your well. Looking forward to the book. What fun & how delicious! 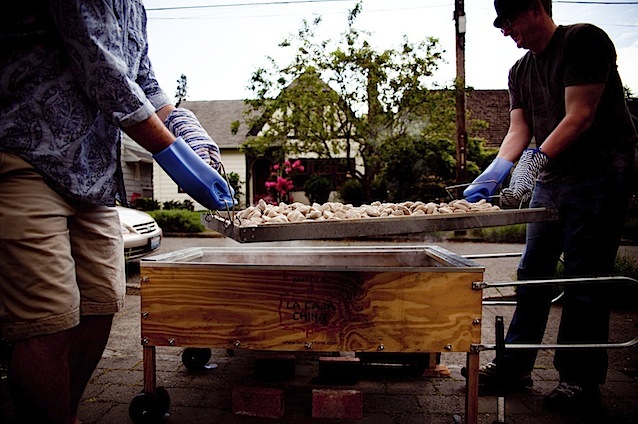 Reminds me of the pig roasts we used to have in my dad’s backyard: Everyone had to earn their keep by doing a turn manning the spit. 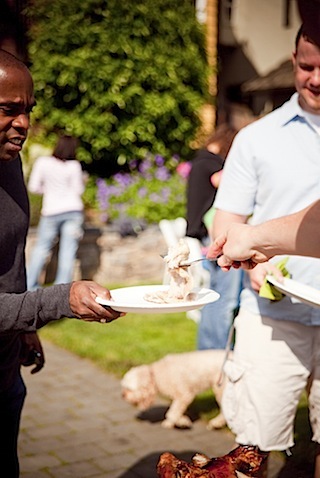 It was always worth it for that first bite — and for the homemade iced cream that followed (inevitably vanilla, spiked with dark rum). What a visceral summer memory this brings up for me. I can practically hear the cicadas (and taste that rum-soaked iced cream…). That looks yummy! I wonder when my Beloved hunts his next hog we might try that. Hogs are vermin here. 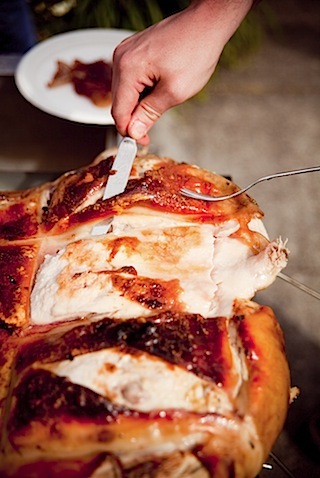 Now I have one extra entry on ‘Things to cook before I die’: marinade and roast a whole pork! Sounds like a lot of fun. 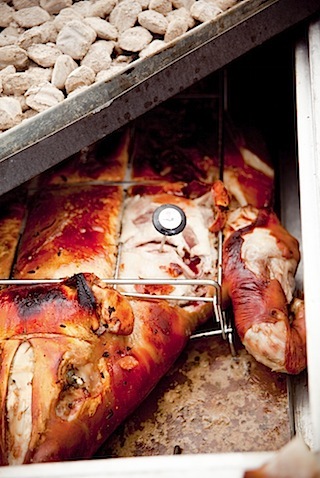 I have eaten whole baby porks marinated and roasted in holes in the ground in Sardegna. They are one of the most delicious food on Earth, but I did not have to cook it then. Congratulations on your move to Portland. 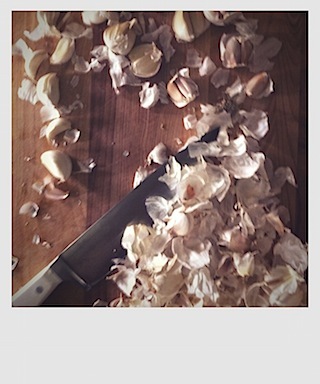 I was wondering if you will be still offering classes in food photography and will you be doing that in Portland. Would love to take a beginners class from you if you have them again. 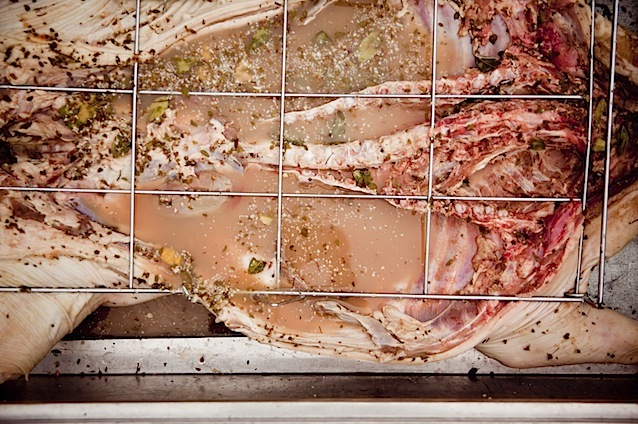 Amazing photos of the pig. 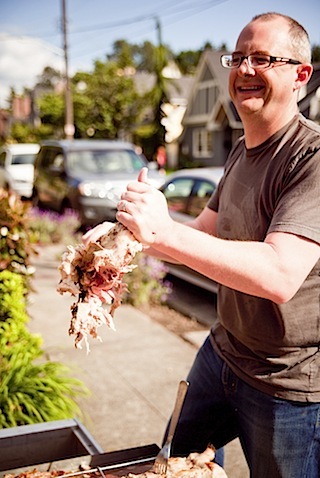 Seattle will be losing a great photographer – but Portland is a wonderful city and will be an exciting place to shoot. 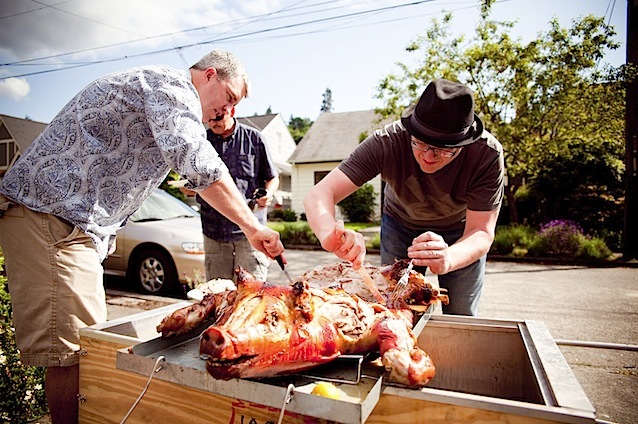 The pig roast looks delicious, I wish my neighborhood did things like that! Whoa the picture with the teeth sure reminds you that it’s a roast beast! Great pictures to document what looks like a good food with fun people. I’m so excited you’re moving to Portland!! 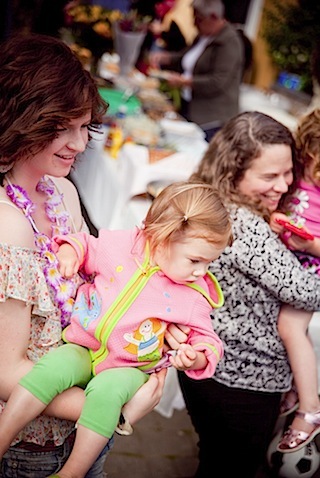 I’m hoping you’ll have some workshops in the near future because now I won’t have to make the drive to Seattle! Welcome, Lara! hi Lara! I just came across this now and am blown away. We don’t often get to see food in such a way and you’ve captured it perfectly. 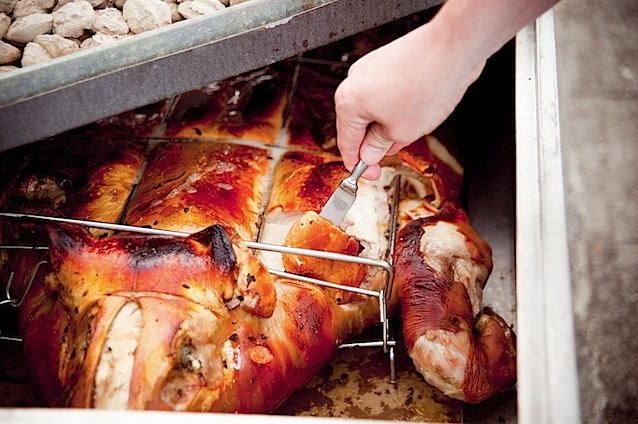 Not only that, pig is my favourite meat. Thank you. Oh ps…thanks for the suggestions on places to check out on our Road Trip. 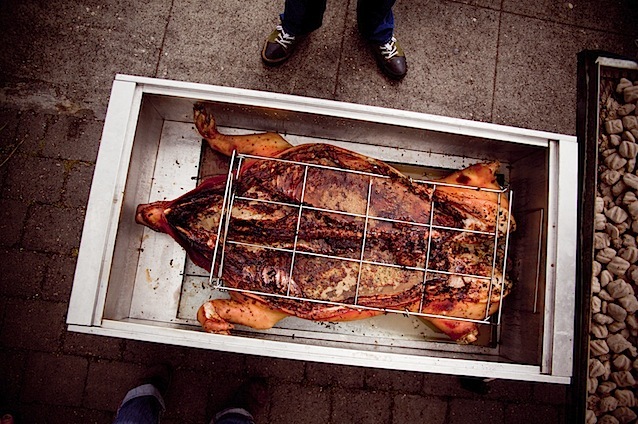 Went to my first pig roast a few years ago. 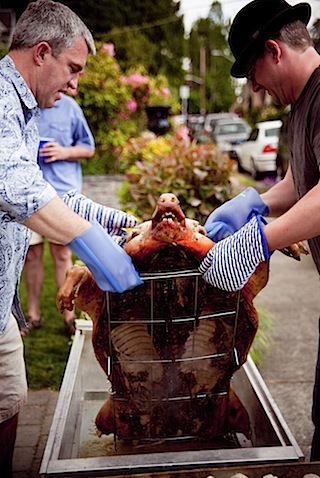 I don’t eat pork so I didn’t try the pig, but it was so much fun, getting together and the community of roasting the pig. Very much a late summer activity that everyone enjoys. 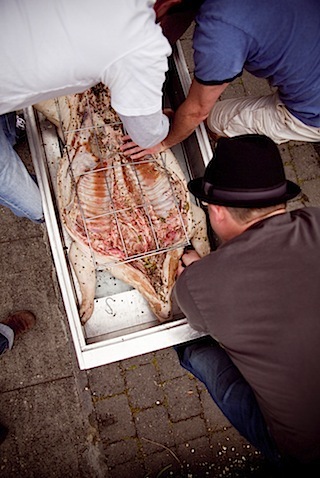 This is awesome, I’ve always wanted to cook a whole pig. It just looks so good. i like it… makes me feel hungry … hehhehe .Those teeth surely added to the magic. Looks like A LOT of work…but I’m drooling right now….looks soooo good…..!!! OMG! this is SO Pity..Such a “beautiful” UGLINESS..
YUM, I have the perfect coleslaw recipe for pulled pork sandwiches.